This is a workflow for ArcGIS Pro software users. It is assumed that ArcGIS Pro is installed on your computer and that your software license administrator has given you the name of a license manager server to which to connect. On the Licensing dialog box, click the License Type drop-down menu and click Concurrent Use License. Under License Level, click the license level you want to use: Advanced, Standard, or Basic. In the License Manager text box, type the name of the license manager. The name of the license manager needs to be provided by your software license administrator. Optionally, click Add Backup to add a backup license manager. You can add up to four backup license managers in this way. If you need to add more than four backups, type the license manager names into the last Backup text box separated by semicolons, using the following syntax: @LM_BACKUP_5;@LM_BACKUP_6;@LM_BACKUP_7. The available licenses and extensions are displayed. The core product license (for example, ArcGIS Pro Basic) should be checked by default. If you do not see any licenses, click Refresh. In the Licensed column, select the check boxes for any available extensions you want to use. Click OK. In the upper right corner of the application, notice that you are not signed in. You do not need to sign in to use the application and there is no licensing portal. However, your computer must be connected to the same network where the ArcGIS License Manager software is installed. 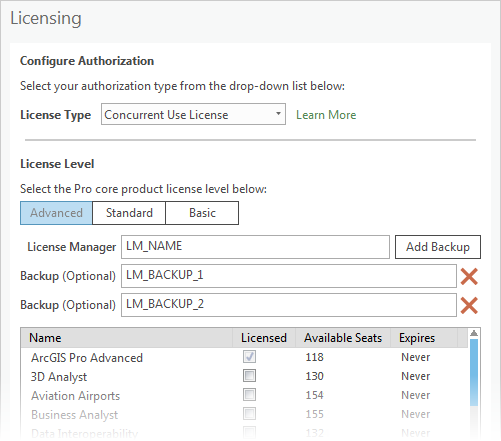 To use ArcGIS Pro without connecting to the license manager, see the Authorize ArcGIS Pro to work offline section below. Signing in to an active portal is necessary, however, to exchange content between ArcGIS Pro and ArcGIS Online or ArcGIS Enterprise. 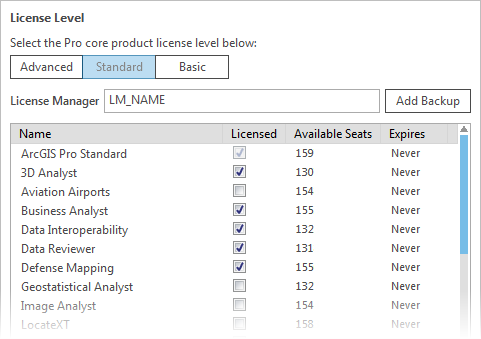 A Concurrent Use license gives you the flexibility to change your ArcGIS Pro license level or to add extensions, as long as they are available in the license manager. Under License Level, click the license level you want and check the check boxes for any available extensions you want to use. In this example, the core product license has been set to Standard and a number of extension licenses have been checked. If you need to work in a disconnected environment, you can authorize ArcGIS Pro to work offline. This allows you to use the application without connecting to the network. If you work in an environment with periodic online access, you can sign in to an active portal to exchange content with ArcGIS Online when access is available. Even when ArcGIS Pro is authorized to work offline, you must sign in to an active portal to get content from ArcGIS Online or share content to ArcGIS Online. Under Settings, accept the default Number of days value or choose a different number of days. If you do not manually return the borrowed license within the specified number of days, it will be returned automatically. Check the Authorize ArcGIS Pro to work offline check box. The license is borrowed and ArcGIS Pro can be used without connecting to the license manager. When you return to a connected work environment, you can take your license back online. You must check in the license on the same machine you used to check it out. The borrowed license is returned.